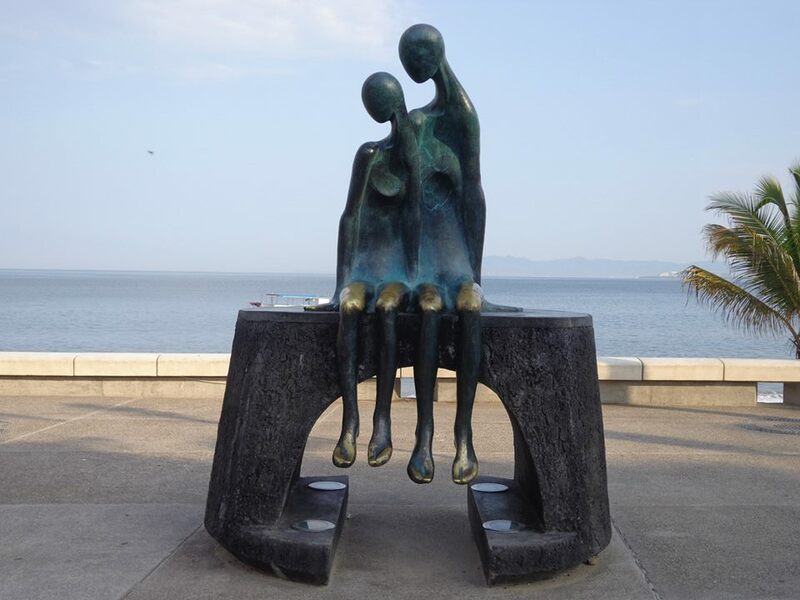 Sculptures of the MaleconEnjoy a stroll along Puerto Vallarta’s seawall prominade. During the day the boardwalk comes alive with various vendors, musicians, jugglers, and artists displaying their handicrafts, as tourists and local pedestrians enjoy the activities amid sparkling sunshine and fresh ocean air. Twenty blocks long, this paved boardwalk follows the curve of the beach and ocean for a one-mile stretch. From the north the Malecon begins at Hotel Rosita (31 Octubre Street), and runs southward ending at the Los Arcos Amphitheater at Zaragoza Street. 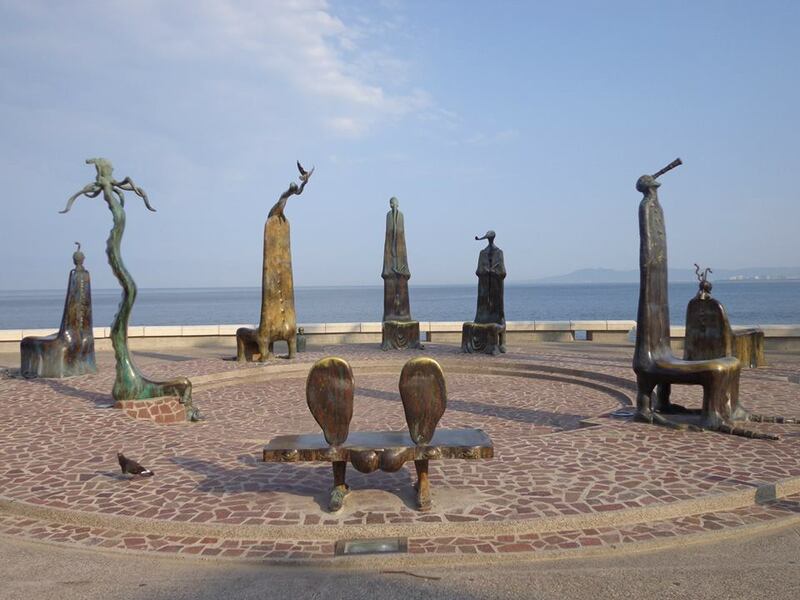 Puerto Vallarta prides itself in its spectacular al fresco bronze sculptures that line the beach boardwalk. Take some time to explore them all. Every Tuesday from mid-November through mid-April, Galleria Pacifico sponsors a free two-hour Public Sculpture Walking Tour from 9:30 a.m. to 11:30 a.m. No reservations required. 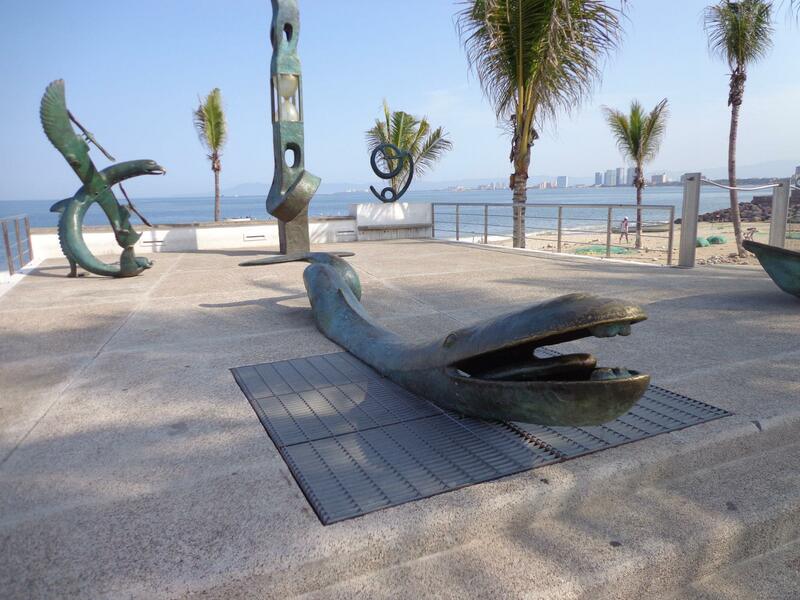 The tour starts off in front of the Millennium sculpture near the Hotel Rosita at the north end of the Puerto Vallarta Malecon. Oftentimes, participants will have an opportunity to meet some of the sculptors of the statues erected on the one-mile boardwalk and hear them speak about their spectacular works. 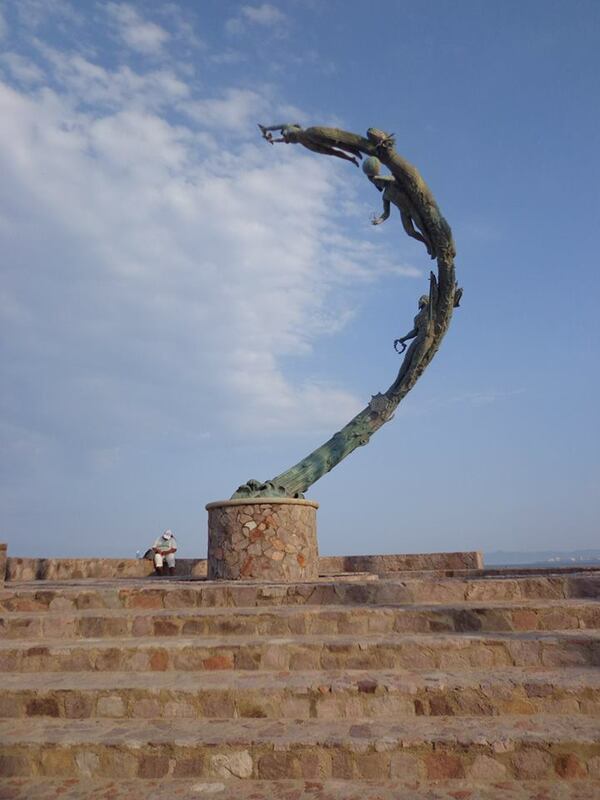 At the north end of the Malecón, the first sculpture is “The Millennium.” This gently curving piece represents the passage of time of time throughout the millenniums. At the bottom of the curve is a DNA double helix and dividing cell representing the beginning of life as humans evolved from the sea alongside octopus, fish, frogs, and lizards. The first millennium is represented by a sword-wielding Charlemagne, and the second millennium by Aztec poet-king Nezahualcoyotl. Our hoped-for future is represented by the final figure, a partially-suspended woman of wisdom releasing a dove of peace, with her face and outstretched arms lift upwards to the sky. 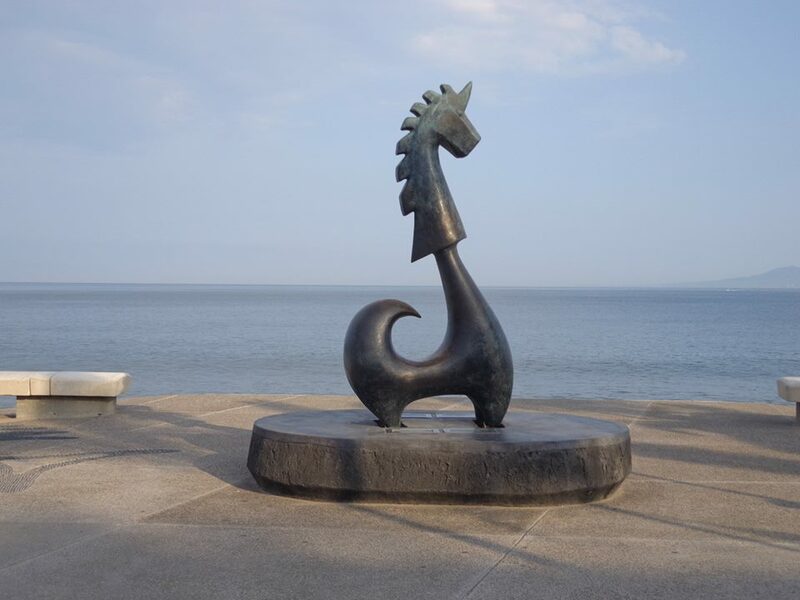 This newest work, “Unicorn of Good Fortune,” was erected on the Malecon in January 2011. Here a unicorn is depicted atop a large circular base. A little farther north is “La Nostalgia,” the silhouette of a man and woman sitting side by side, gazing out toward the city. It is with this bronze piece that sculptor Ramiz Barquet eternalized his love for wife and painter Nelly Barquet. Although when they were young the two had planned to marry, over the years they lost track of one another, married other people, each separately raising families of their own. After 27 seven years, in a twist of fate, the lovers were reunited. At the very spot where this sculpture rests, the two spent considerable time reminiscing about the life that they had almost had together. When Ramiz proposed marriage to Nelly, he vowed to create a tribute to their love for the entire world to see. This polymer-resin-bronze sculpture, “Nature by Mother,” is an abstract work representing the continuous cycle of life and death. On display is a crashing wave hosting a woman’s subtle features, poised adeptly atop a spiraling snail’s shell. 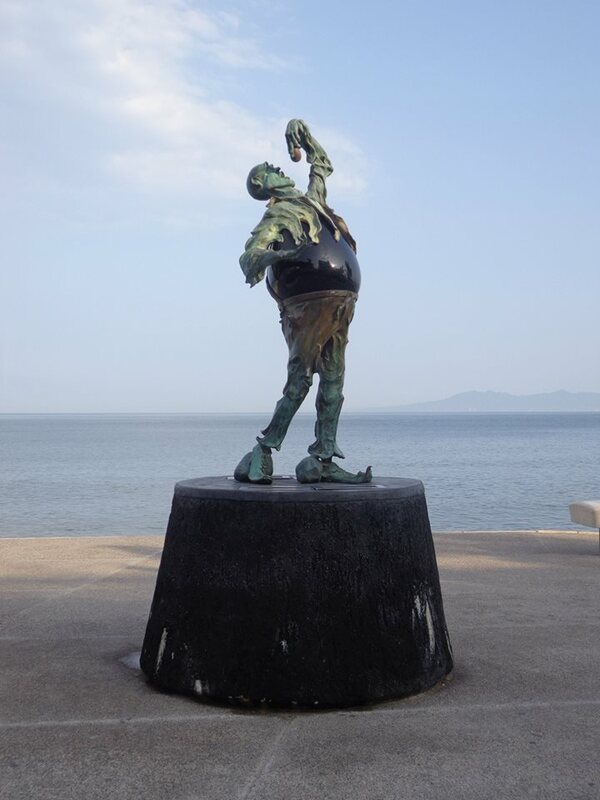 On the Malecon, across from the Hard Rock Café, “The Subtle Rock Eater” is a 2.4-meter-high, bronze-and-obsidian sculpture that depicts a magician in melting clothing holding several stones in his right hand. With stomach protruding, back gently arched, and mouth wide open, his left arm and hand are poised artistically above his head, preparing to drop an egg-shaped stone into his mouth. “The Rotunda of the Sea” is comprised of 8 monumental high-backed bronze chairs. Each whimsical piece features a bewitching mix of exaggerated human anatomy, nautical imagery, surrealism and fantasy. Most of this artist’s works are based upon folk stories he heard as a child. While two gigantic human ears are perched atop one bench, others feature strange and haunting hybrid creatures. 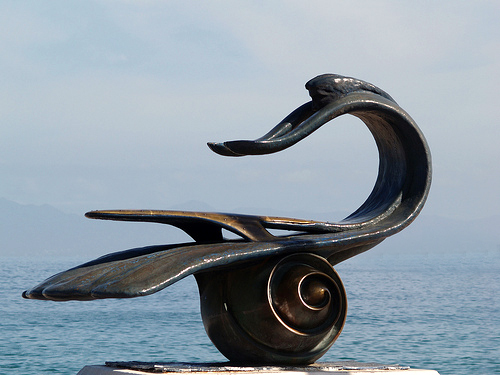 With these intriguing creations, the artist extends an unspoken invitation to all passersby to take a seat, rest for a while, and contemplate the beauty of the ocean. This surrealistic piece, “In Search of Reason,” features two carefree children climbing high on a bronze ladder, reaching out to the sky while their mother, robed and hands outstretched, calls out to them from the sidewalk below. While some viewers imagine that this mother is pleading with her children, asking them to come down, others believe she is encouraging them to be fearless and continue climbing to new heights. Each figure has a puffed-out triangular head that rests upon a short, stout body. 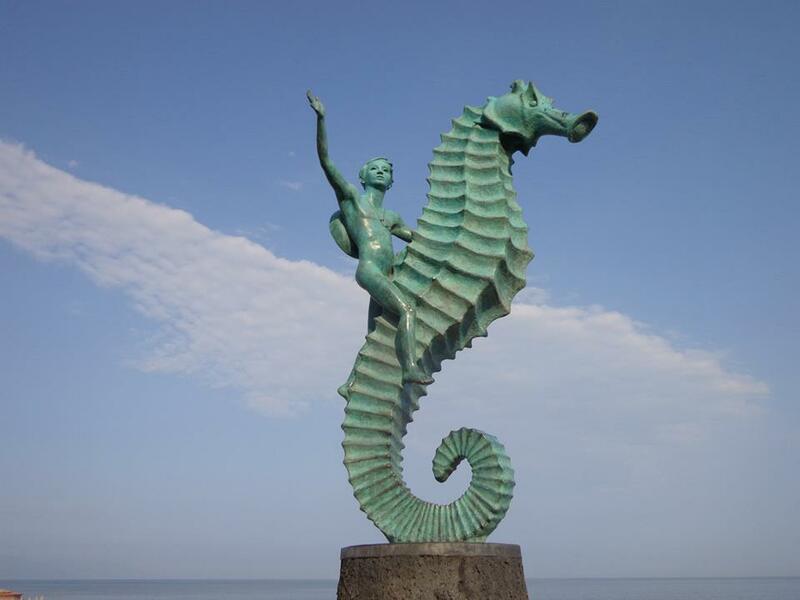 The symbol of Puerto Vallarta, “The Seahorse,” is one of PV’s most popular and recognizable landmarks, and was the first sculpture to be erected on the Malecon. This iconic statue depicts a naked boy wearing a cowboy hat, waving his hand as he rides a giant seahorse. A work focusing on classical mythology and the human form, the mythical Greek figure Triton, son of sea-god Poseidon, is depicted as having the body of a human and the tail of a fish. Triton’s body is gracefully extended as he reaches out his left hand to a Nereid, or sea-nymph. As the waves of the sea lift the mermaid up and slightly away from him, she gently reaches back with her right hand, wrist slightly bent, as her left arm and hand are raised up in an attempt to tame her wild and wind-swept hair. In the Greek tradition, these mermaids are friendly to sea-farers and help them fight storms. 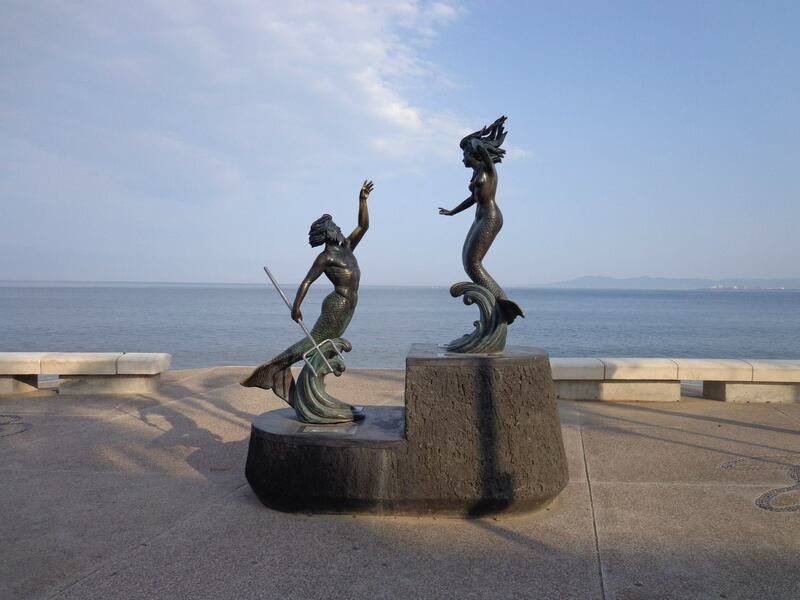 Santa Barbara, California sculptor James Bottom presented “The Friendship Fountain” as a gift to the city of Puerto Vallarta. 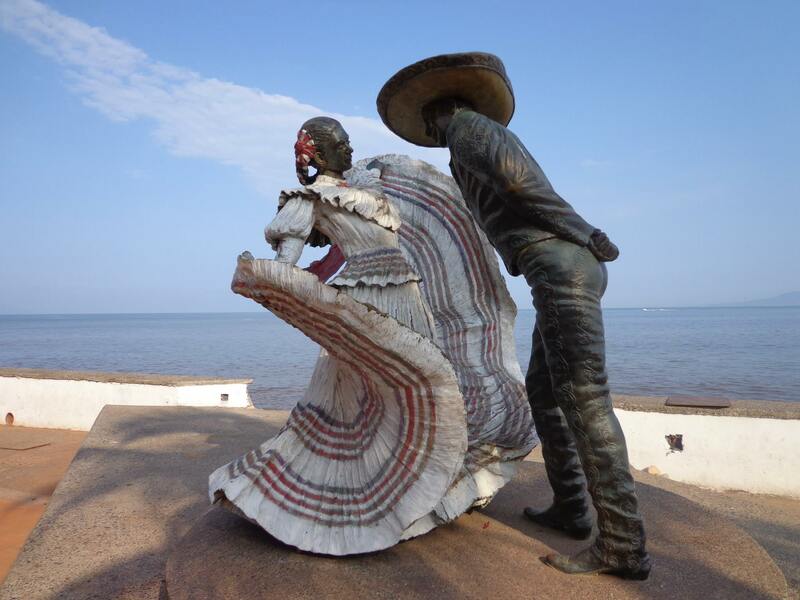 Santa Barbara and Puerto Vallarta have been sister cities since 1972. 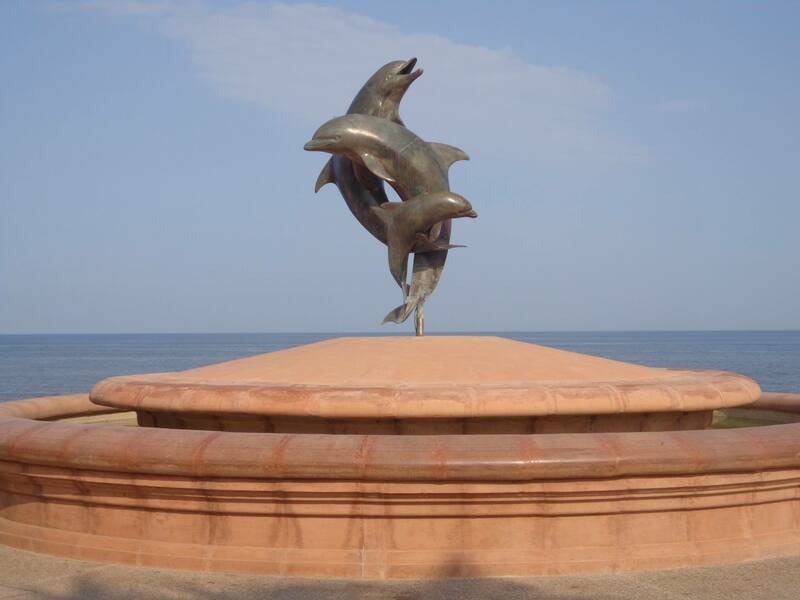 This modern bronze sculpture atop a circular dome-shaped fountain depicts three leaping dolphins which symbolize peace, protection, and the brotherhood that unites the two cities. Each of the dolphins looks in a different direction, one towards the city, one towards the ocean, and another towards the sky. This fountain is located on the Malecon near the Los Arcos Amphitheater. 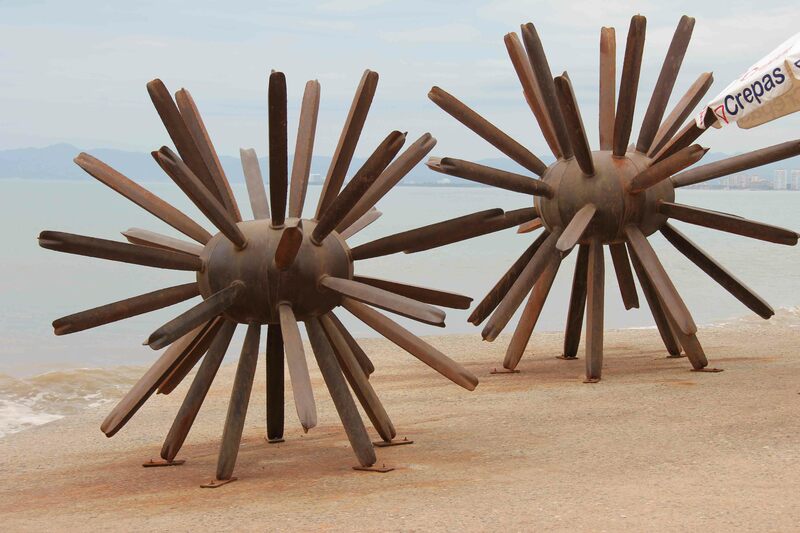 “Standing on End” are a pair of oxidized steel sculptures located near the beginning of the new Malecon extension. The two spiky structures resemble giant sea urchins. 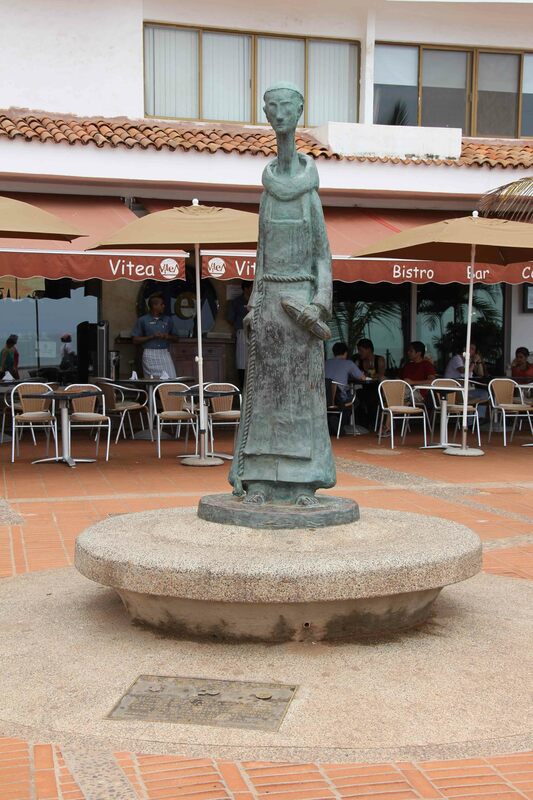 In front of the Vitea Bistro Bar and Café, a statue is erected of a 16th century Spanish Franciscan friar. Saint Paschal Baylon is the present-day patron saint of cooks. 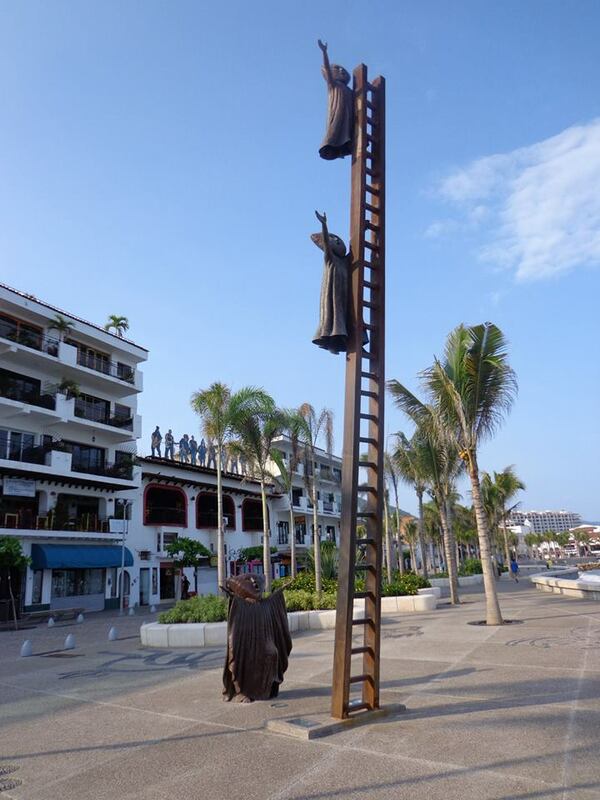 This sculpture was created to honor the chefs of Puerto Vallarta, Mexico, and to also pay homage to all chefs worldwide. 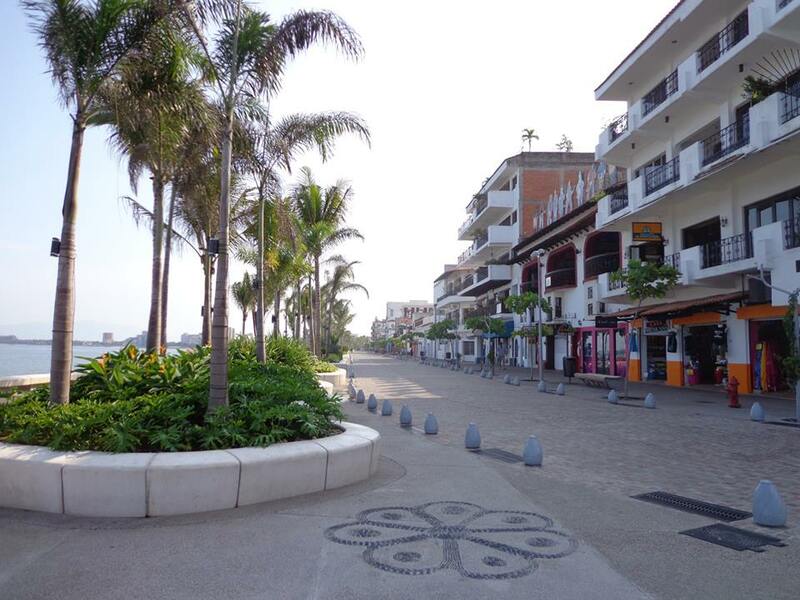 Along the walkway there are several plaques recognizing the culinary skills and contributions of the many outstanding chefs of Puerto Vallarta.